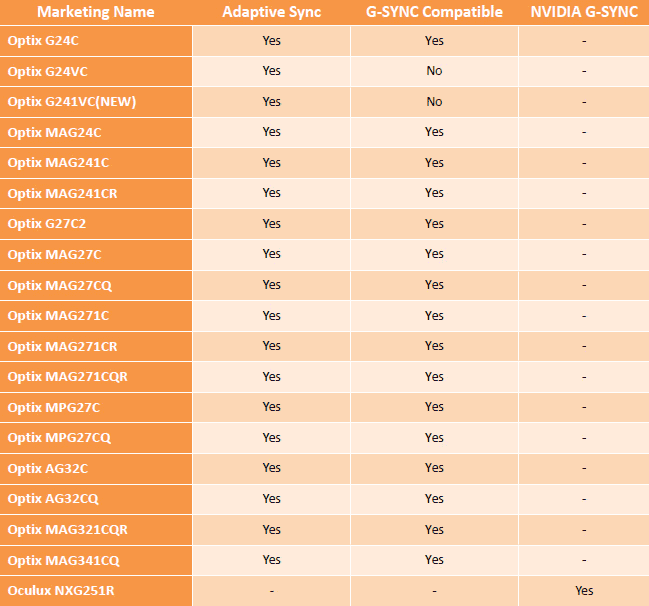 Today MSI boasted that Nvidia would be able to add 16 monitors to the G-Sync Compatible list, as it has competed its own testing on a subset of its VESA Adaptive Sync monitors (testing is still ongoing on models not listed). Interestingly only two MSI monitors 'failed', the MSI Optix 24VC and Optix 241VC(new), but we aren't informed about the criteria in which they didn't make the grade. MSI reminds readers in its news blog post that G-Sync, an anti-tearing, anti-flickering and anti-stuttering monitor technology designed by Nvidia, is now available on most Adaptive Sync monitors and those that pass a range of quality tests qualify for G-Sync Compatible certification. As well as an Adaptive Sync monitor and Nvidia's lastest driver (417.71 or above), those wishing to make full use of the G-Sync Compatible features of their monitor must have a GTX 10 series graphics card or newer. MSI tested all the monitors in the above table with its MSI RTX 2070 Ventus 8G, MSI RTX 2080 Ventus 8G, and MSI GTX 1080 Gaming 8G graphics cards. Hopefully, for MSI, its internal G-Sync Compatible testing won't be contradicted when Nvidia gets around to checking out its range of VESA Adaptive Sync monitors – or it might look at best foolish, or at worst deceptive. Nvidia's official list of G-Sync Compatible, G-Sync HDR, and G-Sync monitors is available here and it doesn't include any MSI monitors at the time of writing. Nice, if we can get other manufacturers to test out whether it's compatible or not, we can save a lot of money just by choosing freesync only with an Nvidia gpu. Also still don't know why Nvidia can't directly say freesync, when will they ever drop the beef. Freesync is AMD's name for it, not the industry standard which is Adaptive Sync. That'll mean prices on these particular monitors going up by £50 at OcUK then. …Those boys never miss a chance to price gouge. Tbh reviewers like hardware unboxed have called bs on nvidia claims when it comes to freesync monitors. My hp omen 32 wasn't on the list but worked perfectly. To be fair, Freesync is an AMD marketing term so they can't really use it. From a practical point of view, they have to tread a line. If they declare Gsync dead then risk alienating their existing GSync customers by making them feel they got themselves locked into Nvidia for nothing. If they stayed as they were then Intel's next gen graphics adopting Freesync compatible adaptive sync would leave Nvidia out on a limb with people buying adaptive monitors for their Intel GPUs and when they decide to get a discrete GPU the obvious choice would be AMD or they have to buy another monitor. So Nvidia have done the only thing they can. They obviously knew it was coming as they built it into the 1080 which was released a long time ago now. That's how long they have been sitting on this feature holding it back from users, which is partly why I am surprised they released it on the 1080 cards. It seems more their way to force people to upgrade to a 20x0 card if they want something new in the drivers, not to give hints that they treat us like a herd to be farmed.